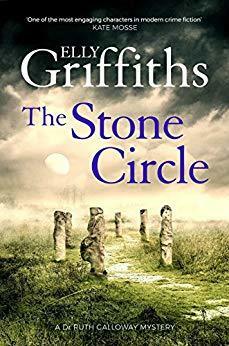 The Stone Circle is the 11th book in Elly Griffiths fabulous series featuring archaeologist Dr Ruth Galloway and terse DI Nelson. Like its predecessors, it’s packed with mystery, complex interpersonal relationships and murder. In this novel, a body is found buried in a recently unearthed stone circle. While the circle is of ancient origins the body definitely isn’t. Enter both Ruth and Nelson whose expertise is required to firstly age the body and then discover who the culprit is. When a cold case is reopened, it’s not long before suspects come to the fore. But when the most prominent of these is murdered, Nelson and his team have to work harder than ever before someone else is hurt – or worse. As usual, Griffiths excels in developing her characters – the regulars and even those introduced because of the central plot. Ruth, Kate, Nelson and his family’s dynamic becomes even more tangled and emotionally fraught as revelations and decisions regarding the future are made and then disregarded. I think Griffiths does real justice to the notion that it’s possible to love two people at once – two good people who don’t deserve to be hurt. While Nelson is torn between the two women in his life and his very different families, there’s no doubting his love for them or the fact he’s a good person who can make bad decisions (like other characters in the books). I also like that the women are represented as strong and proud, not passive vessels to Nelson’s wishes or desires. The ending to this novel feels a little rushed – not in terms of the plot, which is nicely played out, but in relation to the main recurring characters. I wish the editors had allowed Griffiths the chance to flesh it out just a little more. Nonetheless, I really look forward to seeing where Ruth, Nelson and the rest of the characters based around King’s Lynn (which really does see more than its fair share of buried bodies, surely?) takes us! My reading year commenced with this wonderful, heart-achingly lovely book. It took me so long to read and not only because I worked over Xmas New Year (see previous post) but because I wanted to savour every single word and delay the gratification of finishing the novel for as long as I possibly could. With good reason. Now it’s over, I am bereft. The sequel to the evocative, poetic and enthralling (I know I am using hyperbole, but believe me, these books deserve it) Strange, the Dreamer, The Muse of Nightmares continues exactly where that novel reached its heart-in-throat conclusion. I refuse to reveal any spoilers except to say that the tale of Lazlo Strange, Sarai and the other godspawn as well as the denizens of Weep is far from over. 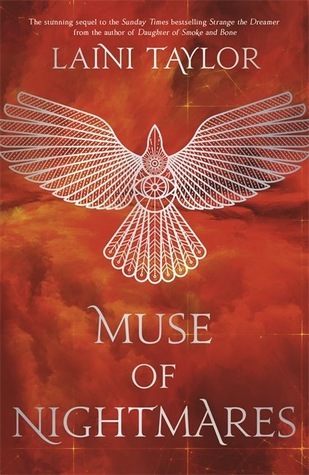 When Muse begins, turning what appeared to be tragedy into something more bearable, another terrible situation posing grave danger to all Sarai and Lazlo know and love surfaces. Forced into actions that cause them and others consternation and pain, Lazlo, Sarai are forced to make deals with the enemy as they seek a solution that will not only save the city but themselves. Just when they think they have opened the lines of communication, another force arrives the threaten them. This is a force that has not only travelled across worlds to find them, but quite literally torn them apart and is bent on a bloody and terrible revenge. Nothing, not even the formidable powers of the godspawn or strength of the Tizerkane can stop it, not without making a terrible sacrifice. Who or what will survive this latest threat hangs by the merest of threads as do the lives of those we’ve grown to know and love. Unable to prevent catastrophe or reason with a mind destroyed by pain and loss, Sarai and Lazlo have no choice but to risk everything, including each other. But even then, will it be enough to save those they love? Just when you thought the world containing Weep, the godspawn, Seraphim, Tizerkane and the ugliness and cruelty of the gods as well as they gentle beauty of Sarai and Lazlo’s love could not be any more enchanting or action-packed, there’s this book. Page-turning, heart-churning and utterly captivating, Taylor brings her characters, their mystery and terrifying allure to life as only she can. This story of gods, god-monsters, and the monstrous and wonderful humans who fear and loathe them, grabs the reader by both throat and heart and squeezes. With each page, you are pulled into their impossible reality and taken on a journey like no other. Taylor’s world building is sublime the way she develops her characters, explains their motivation, explores their thoughts and feelings is magnificent. If you love beautiful stories told with the delicate and dreamy touch of a master story-teller, then this is a tale for you. My only regret, as I knew it would be, is that I have now finished. I hope Liani Taylor writes another one very soon. This is the fourth instalment in Robert Galbraith’s (aka J.K. Rowling) detective series based on former war veteran and now PI, the fabulously named, Cormoran Strike. This book, Lethal White, picks up from the moment the last one ended – at Robin’s imminent wedding and will she/won’t she. From there, the novel then jumps to a year later, and a rather strained relationship between Strike and Robin has developed. Before we can plume the depths of this, a new case presents itself, a new case that involves the blackmail of a current minister – the one responsible for the London Olympics as it happens. Seemingly unrelated to this is the strange tale of a young man who seeks Strike’s services to uncover the mystery of a murder he saw years earlier. Intrigued and concerned, Strike cannot let this young man’s request go, even if the story appears to be the product of a disordered mind. As the case around the minister throws more leads that become increasingly complex and appear to be misdirections rather than aiding a resolution, it’s not until a murder occurs that Strike and Robin understand they’re dealing with desperate and dangerous people. So dangerous that, the closer they get to solving this tangled web others have weaved, the more other lives, including their own, are put in danger. 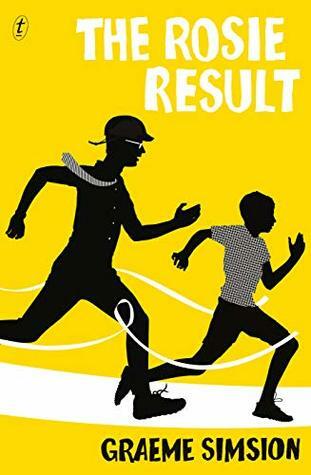 Once more, this is a slow-burn, gum-shoe detective story that relies heavily on old-fashioned plodding police and brain work rather than technological devices and DNA to be solved. Galbraith takes the reader into London, Westminster and the heart of dysfunctional families and relationships, including Strike’s and Robin’s in order to bring sense to this series of senseless crimes. Not only does London become as much a character as do the various homes and offices to which we’re privy, but class plays a big role as well. The way Galbraith captures the smells and sounds of the city or class differences and prejudices with just a word or brief description is magical. Longer than the other Strike novels. I absolutely loved losing myself in Robin and Strike’s world and the differing viewpoints. Understanding how Robin and Strike regard each other, how they attribute certain motivation and even actions, is really well done. So too is seeing how they operate successfully and unsuccessfully in their relationships with others. Causing pain or having it inflicted upon them seems to be par for the course for these integrity-rich pair. You’ll find yourself bleeding for them as what’s apparent quickly to the reader takes longer to become clear to the one in the thick of it. Nevertheless, you champion their decisions and actions – even wrong ones – because you know they come from either a good place or they’re the right ones for them at that time. This is what Galbraith has given the reader – characters that live and breathe on the page and thus ring emotionally true. We care deeply. 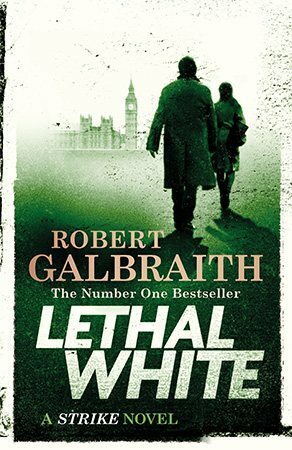 Equal parts frustrating and rewarding, the further we get into the main tale, the more complicated and twisty it becomes, but never does Galbraith lose the plot. She also manages to expose the vulnerabilities and fears of her main characters without weakening them – on the contrary, their foibles give them additional strengths and make them so very human. I was so disappointed when I finished this book. Not so much because the plot was amazing (which it was), but because it’s so very easy to care for Strike and Robin and want to be a part of their world. I guess even for a short time is better than none. But now I have to wait so long for the next book… again, waiting is better than having nothing to wait for. Another fabulous read. ry captivating me in a way I haven’t been for a long time. Not only that, but I found myself shedding tears I didn’t even know were gathering. Some were from sadness, but others were from the joy descriptions of simple things arouse – like a beautiful flower opening its petals, a painter’s palette summer sky, the cry of a native bird, the sunlight refracting on a river. It was unexpected, quite astonishing and testimony to the power of Ringland’s writing and the magic this tale weaves around your soul. So, what’s the book about? It tells the story of young Alice Hart who, at nine years of age, suffers a shocking tragedy that forces her to leave her childhood home and the oft dark memories and wonderful stories that reside there, and relocate with her grandmother, someone whom she’s never met before. Like Alice, her grandmother, June, carries dark secrets, secrets borne from a deep maternal urge to protect those she loves and which is reflected in the flower farm she runs and, even more significantly, in the broken women she takes under wing and who work for her. Known as The Flowers, they too have secrets and histories that both bond them and, in an attempt to shed the past or at least reconcile it, cause emotional pain. 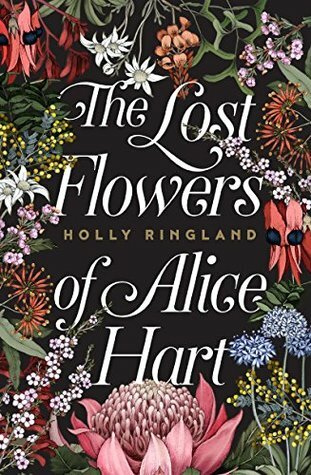 Among these women with their love of stories and each other and the gorgeous flowers, Alice finds a modicum of peace, many more stories to nourish her soul and even love – that is, until something occurs which catapults her into a future she neither imagined or wanted. From fields of sugar cane and the deep rolling ocean, to the flower farm by the river, and ultimately, central Australia replete with its chthonic magic and ancient stories, the book spans over twenty years. It explores different kinds of love, our connection to place, how stories shape us, how secrets do as well. It also examines the choices we make – good and bad – and the consequences of these upon both the individual making them and those they inevitably affect. It’s about residence and forgiveness as well. This is such a soulful, gorgeous book that it’s hard to put into words how it made me feel. All I can say is that my signed copy (gifted by my publisher – and signed to me personally by Holly – thank you, Holly) is something I will treasure. I have also bought the book for others so they too might share in this enchanting novel. There’s no doubt that Ringland is a voice to watch – poetic, powerful and moving – one that has the ability to take the reader on a journey that doesn’t end when the novel finishes. If that’s not an accomplished storyteller with a great gift, I don’t know what is. Cannot wait to see what Ringland produces next.